Last year when we adopted our two sweet children, we sort of went into “survival” mode. Both children had emotional issues, and they need weekly behavioral therapy. Bella was enrolled in a therapy school, and Casey had physical, occupational, and speech therapy. I was spending hours and hour each day on the road. I was happy if I could somewhat maintain the house, and assigning chores to my kids wasn’t even on my radar. This year things are different. My kids have graduated from all their therapy programs. They are sweet, happy children. You’d never know that a year ago they had major issues. (Thank you, God!) And now it’s time for chores! First, I found a FREE printable chore chart here. I printed up three BLANK copies of the chart so I could tailor them for my kids. This website also gave me great ideas of what kids could do a different ages. I might add on more later, but this is a great place to start! I know it’s going to take a couple of weeks for us to get our chores down, but I know the work I put in now will be worth it! I saw this with my first round of kids. The more training I put in now will benefit our family’s team work later. Explain it to the kids. Work with them through the day to follow the chart. Create a small award box. How about you? 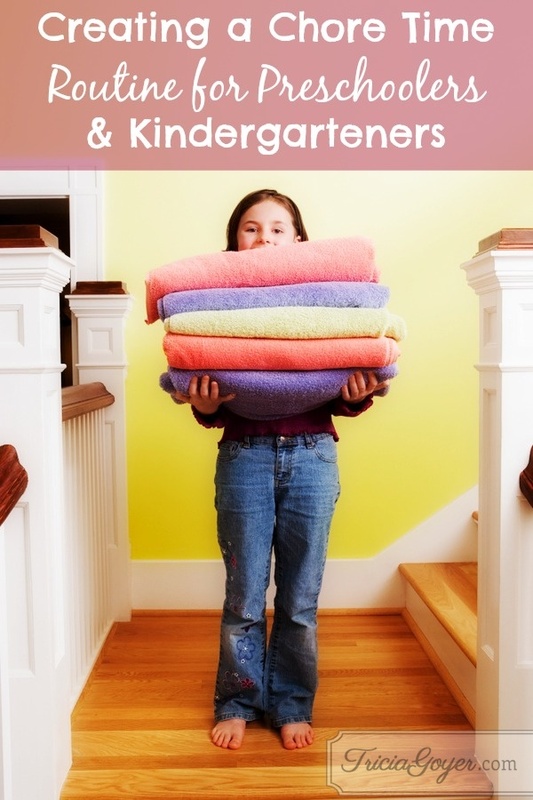 How do you handle chores for your kids? Choose chores for your kids. Train them for their chores. Sometimes it’s so much easier just to do things myself than to train my children. Yet I know that so much of “today” is really about “tomorrow” and the men and women they will grow to be. Help me to be diligent, Lord, to teach them diligence. Help me to be faithful with my time, attention, home and resources, so my children will understand how to be faith to all things you have so graciously given us. Oh my! I forgot the daily prayer!! I’m going to go back and add that! Thanks so much for adding the prayer 🙂 I really do get a lot out of them! Sounds wonderful! Also, helping to sort/pickup toys is a great place to start! Drama has come and gone in the years of their growing up and i think we have issues that not alot of folks do. I pray that the relationships will grow closer over the years, Linda! God can make it happen! I am terrible with chore charts! But my boys need something to help them remember. I have cards that they can see what they need to do without me having to nag them. And it helps them have some independence. I love that idea!! I might try it! Thank you for this post… We added two preschoolers (5 & 4) to our family this winter and definitely still in survival mode. Its hard how much of our chore routine with our oldest (6) has slipped since adding two more but thanks for the reminder that we’ll get there.